demands for greater productivity, more innovation, and doing more with less have made leading at the frontline more challenging than ever. And these same demands have made their roles more critical to the success of our organizations. Year after year, surveys are released sharing the plight of the frontline leaders. While corporations continue to invest in leadership development, there are still significant deficits. Only 18 percent of respondents felt they had a supply of capable employees to fill frontline leadership roles. Just 19 percent of respondents felt their leadership development quality was high or very high. Especially in today’s business climate, these findings paint a dismal picture for the pipeline of future leadership talent that organizations need to survive and thrive. And that pipeline will shrink dramatically if high performers are being turned into disillusioned failures. Obviously, this is not great news. Confidence is low in our current leaders and in the pool of potential future leaders. So how can we help our leaders be better than average? Stop leaving selection to chance! More than 80 percent of responding organizations are relying on manager recommendations, and fewer than 1 in 3 are using validated selection tools (such as behavioral interviewing, simulations, and tests) to select and promote individuals to frontline leadership roles. If you do not have a clear picture of who you want to promote and what their readiness is for that next-level role, how do you know they will succeed? 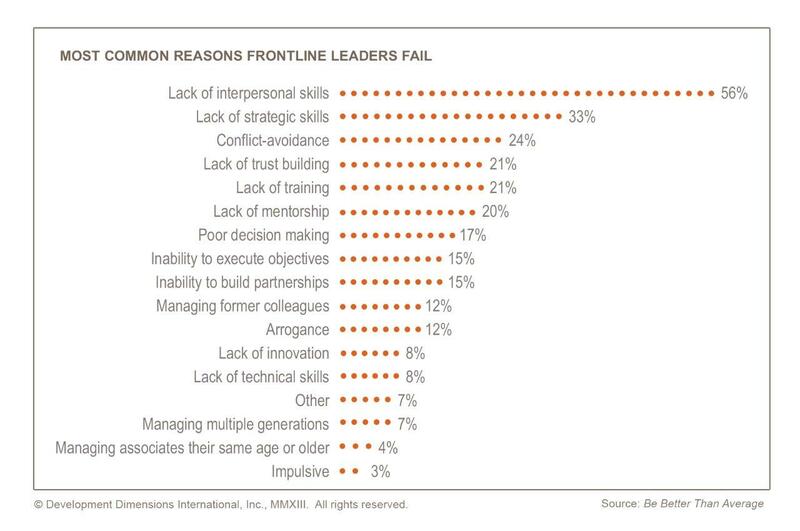 Interpersonal skills were the number one reason why frontline leaders are failing. It is very telling that no other reason was even close as a cause for failure in frontline leaders. Interpersonal skills truly are the foundation for any other leadership skills of importance. You cannot coach without being able to listen or maintain someone’s self-esteem. You also cannot build a team’s trust without the ability to appropriately share thoughts, feelings, and the rationale behind decisions. Organizations have to help leaders build a strong foundation in these skills—they use them in every interaction they have with their team, with their managers, and with their coworkers. And using these skills will truly separate the average from the exceptional. 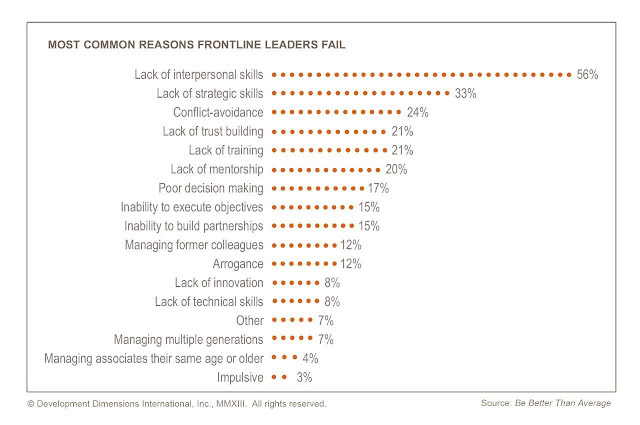 Coming in second as a cause for faltering leaders is a lack of strategic skills. Expectations may be changing for this group as organizations get leaner and flatten leadership levels. Many are being asked to execute tactically but think strategically. Leaders are not receiving the development or support that they need to succeed given these new expectations. The best HR organizations view frontline leadership as a springboard to higher-level roles and the most promising frontline leaders as future senior leaders. In fact, 73 percent of organizations who reported having very high quality frontline development programs were developing these leaders for future roles. So focusing on preparing high-potential frontline leaders early in their careers for higher-level positions makes sense. Organizations that rated development as low described their frontline leaders as unprepared, indecisive, scattered and scared. But organizations rating their development quality as high and felt they had a strong bench, referred to their leaders as capable, confident, ambitious and innovative. 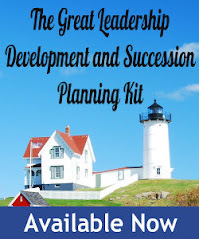 The research also found that leadership development should not be a one-time event. Organizations that implemented a “learning journey” approach to training and development (including on-the-job training, learning from others and coaches, and formal training events), increase the perception of their development quality by more than 90 percent. And when programs are higher quality, confidence in frontline leaders to ensure the future success of the organization grows. Organizations using the learning journey approach to develop their frontline leaders are nearly three times more confident in that level of leadership. Organizations who get it right are finding ways to engage their leaders before, during and after the formal development events with the right mix of methodologies. Creating a culture of continuous learning in their organizations enables companies to better prepare and develop their frontline leaders, and reap the benefits of being above average. Rich Wellins is DDI SVP and co-author of the DDI | HR.com study, Be Better than Average: The State of Frontline Leadership.